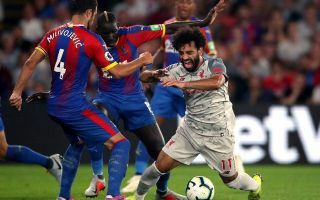 Liverpool secured a 2-0 win over Crystal Palace on Monday night, but the game didn’t pass without a contentious moment as seen with the awarding of a penalty. The Reds opened the scoring through a James Milner spot-kick after Mohamed Salah was adjudged to have been brought down in the box by Mamadou Sakho. Sadio Mane wrapped up the victory in injury time with an excellent counter-attack, but question marks remained over the penalty incident with replays suggesting that there was contact, but not enough for some. Luka Milivojevic has now revealed that he urged Salah to be honest and tell the referee that it wasn’t a penalty, but unsurprisingly, the Egyptian international wasn’t ready to be so accommodating given the decision had already been made and it ended being a crucial moment in the game. “I told him ‘Say to the referee it’s not a penalty’. But he said it was. From his point of view it was a penalty,” as reported by the Daily Star. Watch the video below to make your own judgement on whether or not it was a penalty, but it would appear that Milivojevic’s plea to Salah fell on deaf ears as the Merseyside giants made it two wins in two games to start the new campaign as they continue to impress for the most part. As mentioned above, there was contact as per replays, and so Salah shouldn’t have felt under any pressure to try and convince the referee to reverse the decision anyway.